Born Margarita Carmen Cansino. One of the original transformative actresses of Hollywood: changed her hair color eight times for eight different films, and her name twice. Appeared in 61 features; one of only six women to dance with both Fred Astaire and Gene Kelly during their careers. Promoted by the Adobe web platform team, the CSS Shapes Module aims to create the same visual effects that have been available to desktop print designers for decades – including wrapping text around and within shapes on the page – available to the web. This means we can rapidly create magazine-quality layouts on web pages, with little PhotoShop trickiness required. The Shapes spec is defined across two modules. At the head of each is a property: shape-inside and shape-outside. While there are many possible variations, this article will concentrate on what will likely become a very popular application of the latter property: using an alpha mask to wrap text around the shape of an image. Up until now every image, no matter what visual information it contains, has been always treated as a box on a web page, forcing text to wrap around it in a rectangle. At this stage I’m going to assume that you know how to make an alpha masked PNG image. If you’re unfamiliar with the process, I’d recommend reading one of my articles on the subject; you can also download the PSD, PNG and mask image to work along with this tutorial. <p>Born <span itemprop="additionalName">Margarita Carmen Cansino</span>. Gene Kelly during their careers. The image is floated: note that in the current implementation of the spec, the content to be wrapped must be floated and have its width and height declared for shape-outside to work. You might think that CSS Shapes would use an alpha mask built into the image for wrapping, but it doesn’t: rather, it references a separate specially-formatted image, and uses that as a guide. In principle, this makes CSS Shapes more adaptive: you can apply a wrapping shape to an image format that doesn’t directly support alpha masks (such as JPEGs), or make a wrapping guide that is completely unrelated to the bitmap content of the presented image. Turn off the visibility of the Rita Hayworth layer. Turn on the visibility of the Black Background layer immediately underneath it. 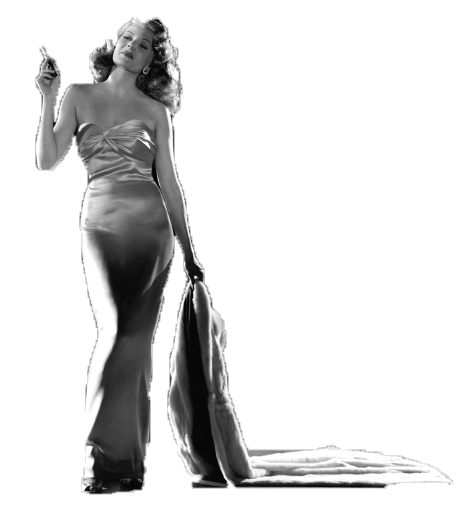 Hold down the Option / Alt key and drag the mask from the Rita Hayworth layer to the Black Background layer, duplicating the mask. (If you're asked if you want to replace the existing layer mask, say yes). The guide image has to be in Indexed color: choose Image / Mode / Indexed Color… from the menu bar. You’ll be asked if you want to merge visible layers and discard hidden layers. Click OK. In the window that appears, choose Exact palette, Forced black and white, transparency on and no Matte. Save the image in PNG-8 format, ensuring that Transparency is on; ensure that the new image is saved in the same location as the original mage. Depending on the browser you’re using, you may find the result doesn’t do much. The CSS Shapes module is supported in Chrome 37+, Safari 8+ on mobile and desktop (behind a vendor prefix), and the latest version of the Android browser, but not Firefox or IE / Edge. However, all is not lost! There are many more possibilities in CSS Shapes, which I will explore in future articles; if you’re especially eager, Sara Souedian has an excellent article on the topic.